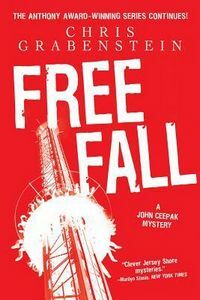 Free Fall by Chris Grabenstein: Synopsis and Online Purchase Options. Synopsis (from the publisher): I didn't do it! is something cops hear all the time. But when the plea comes from a close friend who's fallen on hard times, it's tougher to ignore, especially for young Officer Danny Boyle. It's the start of another action-packed summer for the wise cracking Boyle and straight-arrow cop (now Chief of Detectives) John Ceepak down the Jersey Shore as they do their best to help Danny's friend, a young nurse who claims she has been falsely accused of aggravated assault by a prestigious Sea Haven doctor. Ceepak's unshakable code of honor is tested when he trusts that the nurse is telling the truth. It's stretched to the limit when one of the nurse's home health care patients turns up dead. Now Ceepak and Danny must answer the hard and horrible question: "Did we just help a friend get away with murder?"